Recently, we went to an outdoor, live nativity. I felt that familiar Christmas lump rising up in my throat, as the actors played the parts of the familiar characters. A REAL BABY played the part of Jesus, in swaddling cloths. So precious. As I sat there on the risers, in my parka, I kept thinking about the night of Jesus’ birth. The animals would have been hurriedly led away from the feeding troughs to make room for their overnight guests. Because a REAL BABY was coming soon! They had to prepare him room. All these year’s later, Christmas is still about preparing room. It’s not about filling rooms, or boxes or plates with more. It’s not about preparing dinner, preparing the tree, preparing the gift wrap, or even preparing the worship service you might help lead. Christmas is about preparing room — a contradiction to a world that constantly crowds out the best, in favor of the loudest. Let’s prepare room, because a REAL BABY is coming soon. Christmas is about removing the clutter in our hearts and lives to prepare Him room. At Christmas time, less is more. Look to the manger for proof. See the sacred smallness of a barn in Bethlehem. Our Savior did not come to earth with great fanfare. His birth wasn’t advertised alongside the Black Friday specials from Best Buy. He came quietly, like a whisper, into the humblest of places… into a barn. but for a life. For a REAL BABY. Will we prepare a place for Him?
. This is a daily devotion, and a family keepsake, all wrapped into one. 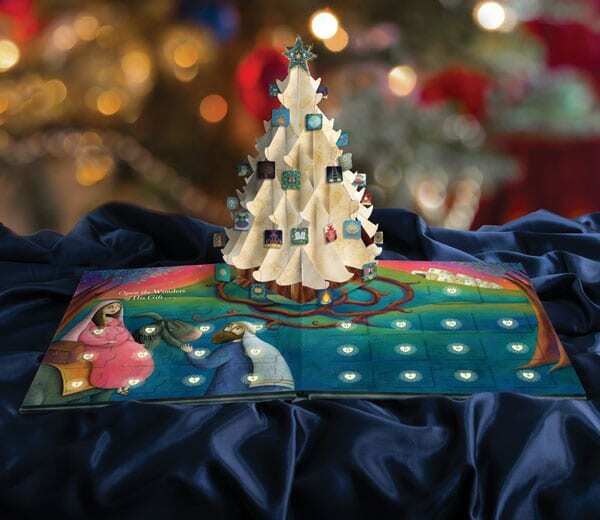 “Each December, families can celebrate the coming of Jesus by opening the book to see a stunning 13-inch, three-dimensional Jesse Tree pop up from the page. At its foot are 25 doors, one for each day of Advent, which hide meaningful, beautifully detailed ornaments―including the Christmas star―that are ready to be hung on the tree. Also inside is a simple devotional book with a reading for each ornament.” Highly recommended activity for kids and adults. (Disclosure: The above contains affiliate links to Amazon, which means I receive a small amount of Amazon credit for recommending the book. Our featured writer this week is Richella Parham. As she says, it’s tempting to only post Pinterest-perfect or magazine worthy images on social media… especially during the holidays! I appreciated her words (and images!) of real-life Christmas preparations in her household. Find Richella here. I hope your season has been peace-filled, my friend. Lovely, thank you, Jennifer. Making more space in my heart is the least I can do, for all his graces to me. Blessed Advent. Blessed Advent to you as well, Kit. Grateful to have you here with us. My desire as well, Beth. Thanks for being here today. I read that Ann’s true heart is her Advent devotions and she is thrilled to see them shared with families all over the globe! Making room. I’ve been focusing on the holy pauses – I never want to miss Him. The book is so beautiful. So enjoying opening up each day’s devotion and building our little tree, day by day. I especially love the tie-in at the end – He is preparing a place for us, and we need to prepare a place for Him. Jesus teaches us, not only in word, but in deed. Amen? Thanks for stopping by Barbara. What a beautiful post, Jennifer. True confession: I never really thought about how the hosts would have led the animals out to prepare room for a baby to be born. And yes, don’t we still need to clear away the clutter of our hearts to prepare room in there to celebrate Jesus? I’ve struggled with just how to do this each Christmas. But, I’m gradually figuring it out, and yes, it has a lot to do with “Less is more.” Activities, tasks, general busy-ness . . . some of this is clutter that can be cleared away to prepare a place (and time) for me to spend with my Savior. As a farmer’s wife, constantly around livestock and barns, it astounds me to think that our Savior came into the world in the way that He did. A Real Baby. Sometimes we need to remind ourselves that indeed he was a real person, in the flesh, here on earth. Thanks for this, Jennifer! Truth. … Fully God; Fully man. Astounding truth. Humbly and in awe, I still can’t believe what He did for us. Thanks for hosting! A joy to host. All for Him. Jennifer! Thank you so much for the feature! I’m honored to be featured here. And I’m humbled to ponder once more how much I need to work on preparing room for the Christ child. 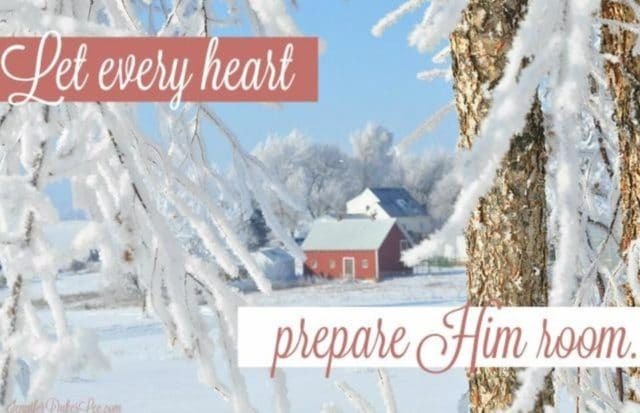 Just yesterday I put a message on the chalk board on my front porch: “Let every heart prepare Him room.” Like you, I’m especially drawn to that line! May God bless you and yours mightily this season. I’m grateful to be joining you again with some thoughts about Advent. Thanks so much for hosting! In her new book, Living the Season Well, Jody Collins entices the reader to slow down and simplify with the intention of holding a space for him to come. Even as I write cards, wrap gifts, clean for company, etc., I can practice his presence and worship him with gratitude that “God imparts to human hearts the blessings of his heaven” (from O Little Town of Bethlehem). Because of Jesus, those blessings abound! I really enjoyed Jody’s new book, and was delighted to provide an endorsement for it. She’s such a blessing. After this post I am looking at ‘prepare’ a little differently. I love that whole thing about making room – and not just in December (although December brings more of those boxes and things that need to be moved out of the way to make room.) Blessings, Jennifer. So true it is about preparing room in our hearts for Jesus. I think I better get started.